The actor and model celebrated the Fourth of July festivities Mexican-style, toasting to the United States’ independence with tequila and enjoying regional dishes. She really likes it! 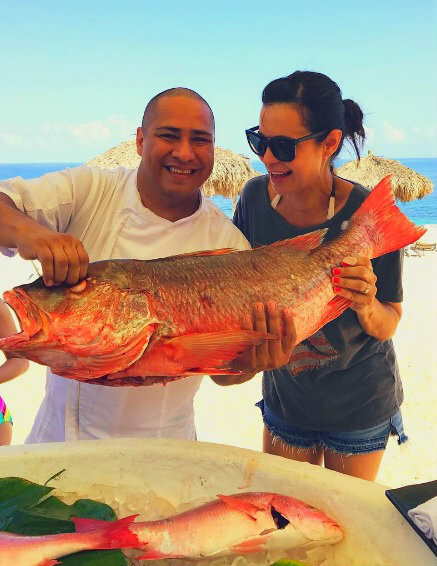 US actor and model Catherine Bell seems to have found in the Riviera Nayarit a favorite haven, as in the past three months she’s twice chosen Punta de Mita, the Glamour Peninsula, for her vacations. This time Bell celebrated the Fourth of July festivities Mexican-style, toasting to the United States’ independence with tequila and enjoying regional dishes, including the pescado zarandeado. After her first visit—which took place in May—the celebrity fell in love with the Riviera Nayarit’s gorgeous natural scenery and the excellent service received during her stay at the Four Seasons Resort Punta Mita. So much so, that she promised to return… and she did! By June 28th Bell was already “counting the days” until her return to the destination, announcing her visit on social media and thrilled to this time be “with the kids,” since in May her trip was a solo one. The actor and model once again booked a stay at the Four Seasons Punta Mita where she was treated like a queen, as can be seen in the images she shared on her social media accounts. In the pics, Catherine is captured fully enjoying the hotel’s amenities and there’s a record of her visit to the Islas Marietas National Park, where she even hopped on a paddleboard. The response from her followers on Instagram was immediate, with messages of appreciation for sharing such beautiful pictures and asking her whereabouts on the one she posted of her on a paddleboard. Catherine Bell has 41.2 thousand followers on her official Instagram account, 35.4 thousand on her Facebook account and 72.7 thousand on Twitter. The British actor and model is remembered for her role as Sarah “Mac” MacKenzie in the series JAG, where she worked between 1996 and 2005. From 2007 forward she can be seen playing Denise Sherwood in the Lifetime TV drama, Army Wives. Her first appearance on the big screen was as Isabella Rossellini’s body double in the movie Death Becomes Her. Afterwards she participated in movies such as Men of War, Black Thunder and Bruce Almighty, with Jim Carrey and Morgan Freeman. Other credits include Alien Nation: Body and Soul, Cab to Canada, The Time Shifters, Company Town and, more recently, The Good Witch and its sequel, The Good Witch’s Garden.